Hugo & Cie, 2009.187 pp. If one had to find a cinematic equivalent to My life with the Ovahimba, it would be a "making of", the narrative of the more or less epic adventures a film shoot. The comparison works all the better since the author is a filmmaker. In this case of the rare species of documentary-ethnologists who feed their works long stays with the people they intend to shoot. When Rina Sherman let to settle with the Ovahimba, livestock farmers in Namibia, she intended to follow the footsteps of Jean Rouch. She had been a pupil and assistant to the author of The Crazy Masters (Les maîtres fous), and now wanted to explore her own field of study. 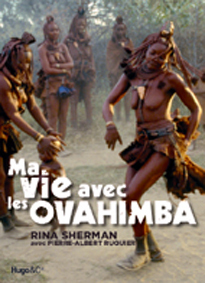 She however did not imagined that she would live for seven years among the Ovahimba. Seven years during which she has forged extremely close links with the family of Chief of the Etanga community in Namibia. "Kakendona is my sister. She says that our spirits are swopped. She is from the Tjambiru lineage, the youngest daughter of the headman of Etanga, in other words, a child of the lineage of eight generations of chiefs. With her, we committed the “400 coups”. We laughed, danced, drank and talked ". Soon R Sherman called the head of Etanga “father," a title which, far from being merely honorary, reflects mutual affection and respect. "One morning, we decided to climb the oHere hill behind the house. My father, this thin man of noble bearing, a heavy drinker, led the way at a rapid pace. (...) He looked at me, then let his gaze sweep over the panorama. No doubt in it he saw different things than me. (...) He saw a distant pasture, water sources, a well, the right to access inherited at birth, the road leading to it, his house as well. The entire difference between the outlook of my father on this landscape and mine was present. I was imagining a painting, he was reflecting on his life." If over time, R. Sherman shares a real league with "her" family, she encounters the thousand pitfalls of social and cultural differences. The filmmaker has come to work, gather information, film daily life and, if possible, the rituals of possession of the Ovahimba. They inevitably consider her to be "an opportunity of wealth." She refused to lend her car all the time, confronting the common sense of her guests. She even makes real blunders. For this nation of farmers, the only wealth is cattle. Everything else is shared. How can this white person refuse to give water to passersby?, some reproach her. Can they not understand that she cannot devote her time to fetch water?, she complains. Conflicts sometimes result in irreversible crisis. After three years, R. Sherman gave up his permanent camp at Etanga – inadvertently set up on sacred land... A good friend and affectionate, the filmmaker is no less irritable, prone to angriness and proud. This redhead probably draws in her excess energy that makes hold out in Ovahimba country. A happy propensity for transgression, too. One day, the dignitaries gathered for days to distribute the stock of a deceased person, she goes up to them to demand meat, reserved for men on the occasion of this ritual. The filmmaker does not work like a man too? Defying the boundaries between genres, this descendant of the Afrikaners (R Sherman is South African born) also crosses blithely those between whites and blacks, like when inviting the head of Etanga and his wife into a hotel reserved for white tourists, much to the embarrassment of the management. After reading a somewhat disjointed narrative, R Sherman and Pierre-Albert Ruquier leave the memory of a genuine adventure and real insight into the life of an unknown people.